Vientiane (VNA) – Lao Prime Minister Thongloun Sioulith applauded the cooperation and support of Vietnam’s Vinh Phuc province for Laos’ northern localities during his reception for a delegation of the province’s representatives in Vientiane on March 29. Despite its own difficulties, the Vietnamese side has maintained support for several poor Lao localities, he said, noting this reflects the friendship and special relationship between the two countries. The leader called on Vinh Phuc to continue its collaboration and assistance for a number of the northern Lao provinces which are still under difficult circumstances, especially Luang Namtha. He committed to creating conditions for businesses from Vinh Phuc and Vietnam in general to invest in the northern region of Laos, contributing to economic development in the country and bringing interests to both sides. Secretary of Vinh Phuc province’s Party Committee Hoang Thi Thuy Lan, who led the delegation, noted with pleasure the intensive, pragmatic, and effective development of the Vietnam-Laos special relationship, as well as new steps of development in the friendship between Vinh Phuc and Laos’ northern provinces. Informing the host of the outcomes of her working sessions with leaders of the northern Lao provinces, the official said her visit aims to promote cooperation as well as cultural and educational exchanges between Vietnam and Laos, while also seeking out investment opportunities. Lan pledged to enhance collaboration and provide more support in personnel training and material facilities for Laos. 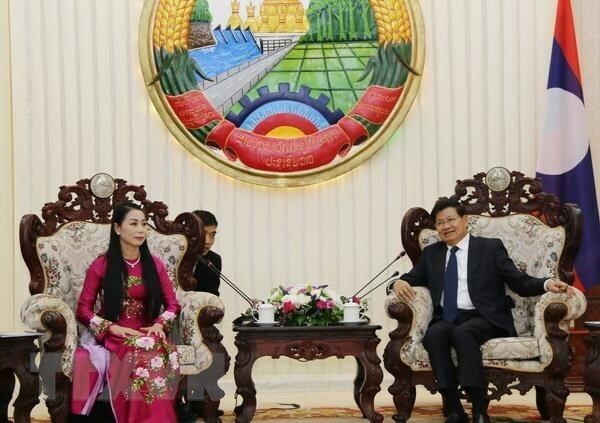 Leaders of the Lao provinces also agreed to step up cooperation, delegation exchanges, as well as educational and cultural links with Vinh Phuc, she said, suggesting the Lao PM further facilitate the affiliation between Vinh Phuc and Lao localities. During working sessions with leaders of Luang Prabang, Udomxay, and Luang Namtha provinces from March 25-28, the two sides also agreed to intensify collaboration in investment, delegation exchanges, and cultural and educational links between the localities. They will support each other in optimising the potential of each side and create conditions for businesses to study the investment environment and set up cooperation, especially in tourism. The Vinh Phuc delegation also visited the Vietnamese Embassy in Laos. Vinh Phuc has so far established friendly relations with the capital city of Vientiane and eight other cities and provinces in Laos. Over the years, Vinh Phuc has given special support to northern Lao localities in infrastructure development in the fields of education and healthcare, with total funding amounting to tens of millions of US dollars.